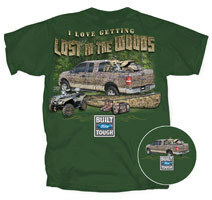 Ford Trucks "Lost in the Woods"
Highly Detailed Small Logo of the script “Built Ford Tough” on the front left hand side chest of this Tee. Above the script is of the smaller scale F150 SuperCab pickup with Dirtbike in the back. There is also subtle in striping behind the script “Built Ford Tough”. This fantastic brilliant artwork is of the legendary ‘Super Duty’ 4x4 F150 SuperCab Pickup from the FORD Tough Trucks stable. Here we have the full “camo” style theme of being out in nature’s wilderness. With nothing but a two stroke dirt bike in the tub, a couple of quad bikes, a canoe and hunting gear, we are gonna’ have a good time! This F-truck is detailed in every way. Particular attention paid to the “mud terrain” tyres, the personalised number plate, and the factory badge and decal emblems as seen that flanks the panels on this truck. The attention to detail flows through to the bike in the back, sporting that big expansion chamber exhaust system, alloy frame work and the custom rate coil spring. Both the quad bikes are carefully detailed, again depicting ready to carve up the mud. Check out that winch hook and mud tyres of the quad in the foreground! The bar work is fantastic. The attention to detail of the artwork is simply brilliant, encompassing the canoe , boots and ‘duffle’ bag. The colours are outstanding. The background of the Tee is set in the forest, with subtle light green pin striping, followed by that legendary “BUILT FORD TOUGH” badge script emblem at the lower of the artwork. The large script as shown on the back of the Tee “I love getting Lost in the Woods” matches the theme of the artwork in “camouflage”. Get out there, and get dirty! 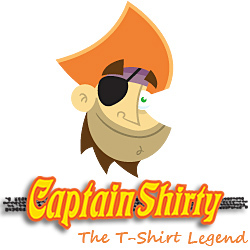 Tee shirt Colour: Available in Dark Green only, with Genuine FORD Official merchandise decal Tags.